We are now 5 games into this young baseball season and it is all smiles at first base for Hanley Ramirez. His defense has been respectable and he actually looks like he could be a major league first baseman! On the offensive side of things, Ramirez is off to another hot start. He is hitting .455 (10 for 22) with 1 double, 1 triple, 1 home run, 4 RBIs,and 1 stolen base. 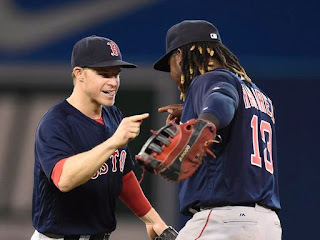 Offensive success is nothing new for Ramirez, but it is great to see after his bad 2015 season. After hitting .293 with 10 homers in April, Hanley went on to hit .238 with just 9 homers the rest of the season. So, why is he off to another great start? Coming into this season, Hanley made some adjustments to better his approach at the plate. Jerry Remy noted this in the telecast on Wednesday night, but I pointed this out first on Twitter about two weeks ago so I will give myself the credit. Yay me. For starters, Ramirez no longer has the super high leg kick. There still is a slight one, but the movement with each swing is cut down tremendously. Secondly, Hanley now starts the bat on his shoulder. In 2015, the bat was essentially vertical. This created a long path for Hanley to swing on. He needed to bring the bat down before he started his swing. That is one extra step in a process that is already hard enough. In 2016, the bat now rests on his shoulder and this puts it an easier loading position. In addition, his knees are now bent. Last season, Hanley was very upright. Now, Ramirez's stance looks much more athletic and it should give him more plate coverage. As a result, Hanley looks much more comfortable at the plate early on. In the video below, you can see that everything is in sync and Ramirez goes oppo taco for his first dinger of the season. 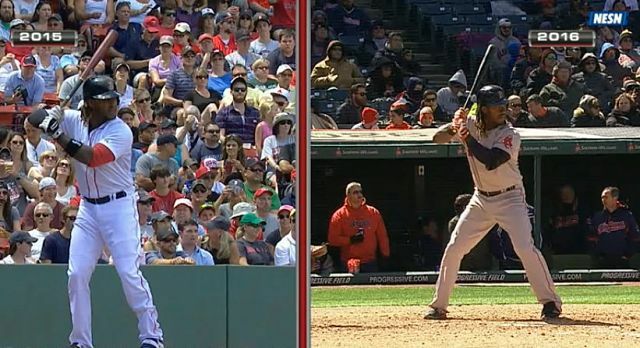 Thoughts on Hanley's new stance?